Snow goggles, board, and flourescent jacket? 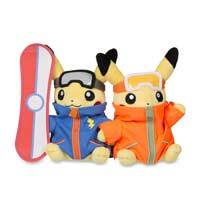 Oh yeah, these Snowboarder Pikachu Celebrations plush look ready to hit the slopes! Two Pikachu ready to shred!